I can never fit enough into one day and I love challenging myself; both physically and spiritually. I'm a writer, a mother, wife and grandma, so every minute of my day is special. I love to travel, watching the sunrise and sunset, and have a wondrous interest in dragons and fairytales. I don't ever want to grow up! Anything that will capture my heart and soul. 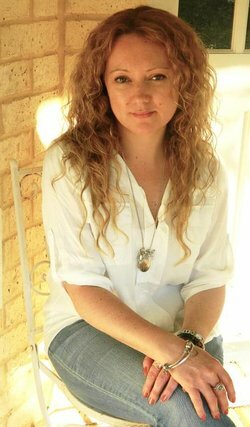 Some of my favourite authors are Rebecca Raisin, D.S Williams, Nora Roberts and Matthew Reilly. I'd be soaking up the Balinese sunshine, poolside, with a cocktail and a good book. I've recently started Pilates! At, um, 40-something, this was one challenge I set myself up for and I'm loving it. I have officially added “Gym Junkie” to my list of hobbies. I also make soy candles and dabble in aromatherapy for nourishing my soul. Real life; either my own experiences or those of others. Even in a young adult fantasy with talking dragons, there needs to be believable stuff for the reader to connect to. Wendy from Peter Pan, of course! Who wouldn't want to hang out with the boy who never grows up and his fairy, Tinkerbell? My writing room, on a comfy reading chair beside the window. Bali, Indonesia. It's sunny, close to home (Perth W.A) and the Balinese are simply beautiful people! Travel, read, fall in love and repeat. Book II of my Infinity series ~ Absolution ~ is set for release in August. It's a gritty, romantic, page-turner ~ perfect for a holiday in the sun! Absolution – Book II of the Infinity Series, is a gritty and confronting telling of a young man’s battle with depression, loss, love and grief. Looking back over the last six years, two major tragedies occurred in my life; both centred around men’s mental health and the lack of awareness on such a poignant issue. With the sales of this book, I hope to raise awareness of some concerns facing men, help reduce the stigma associated with mental health and use proceeds to help support to Beyondblue. One very lucky reader of With Love for Books will win a signed copy of Absolution - Book II of the Infinity Series by Michelle Dennis. I don't think I've read any other fantasty series by an Australian author - will definitely check this out! Interesting interview. Can't wait to read the books. Looking forward to reading your works! Wendy from Peter Pan :) Than I just have to read your book. I love your answer. 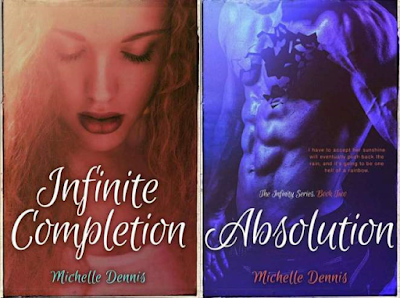 of Absolution - Book II of the Infinity Series by Michelle Dennis. I love the sound of this, I love children's fantasy :) Sounds like a great read Michelle, hope you have a lovely week! A writing room with a comfy reading chair sounds heavenly bookish!